Like so many kids, I grew up playing an abstract outdoor game called War. Spend any amount of time with a group of young boys and play aggression often naturally emerges, lines are drawn and any object within arm’s reach becomes a surrogate weapon. War takes this to the next level. Through the application of ever-shifting rules , a broad framework is created within which you split into teams and then spend hours hunting down your friends. Sometimes finding a secret base in a capture-the-flag scenario is the objective. In larger group games, a tag-like game of collecting kills can determine who wins. For my childhood friends and me, anything from sticks to hand-made weapon replicas to store-bought plastic toy arms made up the main equipment for the game, and our imaginations filled in the rest. 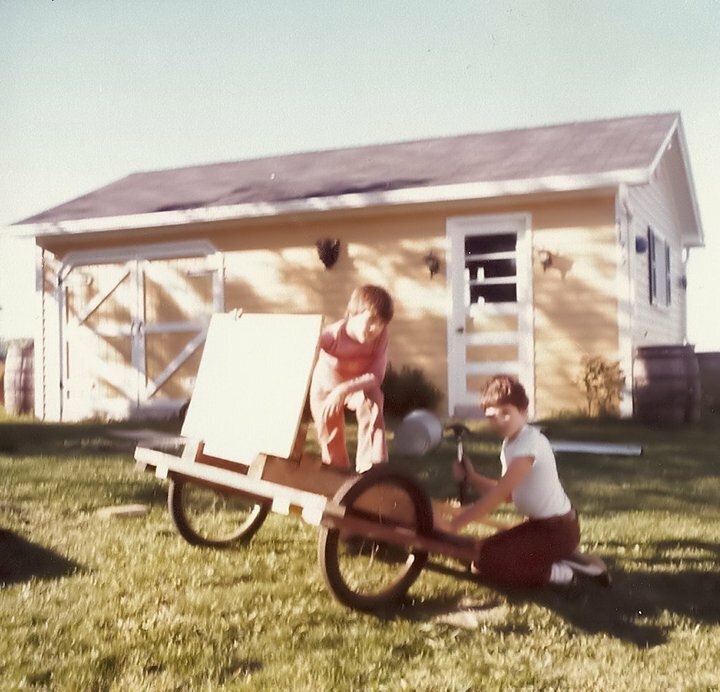 One summer in the late 1970s, my brother and I (that’s me in the blurry snapshot above on the right) built an estimation of a howitzer from some scrap wood, bicycle tires and the side exhaust pipe from a sports car. A friend of mine had a fort built in the woods adjacent to his house, complete with a lockable below-ground prison and a series of three-foot-deep foxholes dug at the defense perimeter. Other pals checked books out of the library to study old photographs of guns they would carve out of left-over 2′ x 4’s. I logged many hours playing War among the fields, woods and buildings in and around my rural hometown in Western New York. One weekend I spent the majority of a Saturday hunting down one of my friends on a nearby SUNY campus in a one-on-one scenario where the first one to spot the other won the war. I found a set of shrubs to hide in where I sat for an hour until I saw my friend creeping through an open plaza. On another day, I was captured and locked in my other friend’s dungeon with another comrade. While more than ten other guys ran around shouting in the nearby fields, we two prisoners spent more than two hours digging a tight hole under the plywood wall to escape. Other times there were weekend sleepovers and night games chasing each other through the woods and over creeks in the darkness lit by flashlights. The new movie “I Declare War” from Drafthouse Films should resonate like a carpet bombing for anyone like me who can look back wistfully to hot summer days of trying to kill their best friends in a game of War. This isn’t a great piece of filmmaking, but its the sort of thing that’s sure to light up parental discussions and also conjure youthful memories of when play involved something without digital graphics. 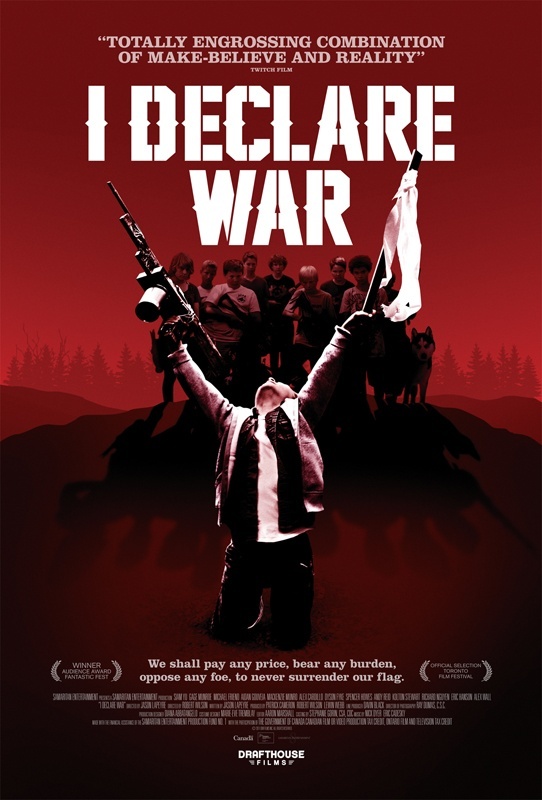 Now in limited release and available through some streaming services, “I Declare War” focuses on a day-long game of War between two groups of adolescent boys (plus one girl). The serious intensity of the day’s game depicted in the movie captures the complexity of the time in life of being a care-free kid teetering on the edge of the ages to come. Most of the kids in the film approach the game with the expected intensity of children whose imaginations are running full-on, transforming sticks and plastic guns into actual weapons. One boy adds a sci-fi flair with imagined lightning bolts streaming explosive death rays from his eyes. There’s also a clumsy protracted love interest that evolves with the young girl’s arrival in the game, but she too winds up being a skilled player in the game. And finally, there’s one truly sadistic kid who treats the game a bit too seriously, bordering on psychological and physical harm to a few unfortunate victims. There’s a lot in this movie, and the game of War presents as merely a mechanic for the kids to work out their emerging pre-adult personalities. Within the group there are plotters, double-crossers, bullies, romantics, innocents and leaders. The kids yell, cry, laugh, fantasize, threaten and swear like kids do — a hot stew of thoughts and emotions most mainstream movies (and many parents) would rather avoid. A couple of the guys I played War with in the 70s and early 80s wound up serving in the real-life military but the majority of us went off to college or started regular jobs after school. For the most part, I’d say we all grew up to be relatively decent human beings. On the balance playing War didn’t warp any of us in a negative way and it quite possibly taught us some early lessons in teamwork, negotiation, problem-solving and communication. For me, it mostly built something along the lines of friendship or strangely, compassion. “I Declare War” captures the spirit of the kind of play which mostly exists now in an abstract virtual world for my own kids and their peers. Did my friends and I rack-up more life lessons playing War in the woods than my sons do playing war on screens with people who they’ll never meet? That question is going to be answered in a generation or so, but “I Declare War” is worth considering in how playing War shaped us a generation ago.